WASHINGTON, D.C. -- American workers are less concerned about being laid off in the coming year than they have been in at least four decades. The current 8% of full- or part-time employees who say they are "very" or "fairly" likely to be laid off in the next 12 months is, by one percentage point, the lowest Gallup has recorded since first asking the question in 1975. 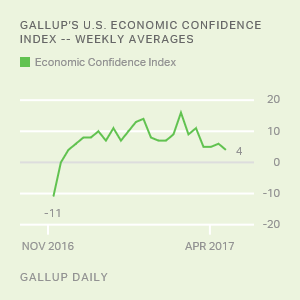 The latest figure comes from Gallup's annual Economy and Personal Finances poll, conducted April 5-9. This year's poll was conducted as the U.S. unemployment rate dipped to 4.5%, its lowest point in nearly a decade, and as workers report increased hiring at their workplaces. 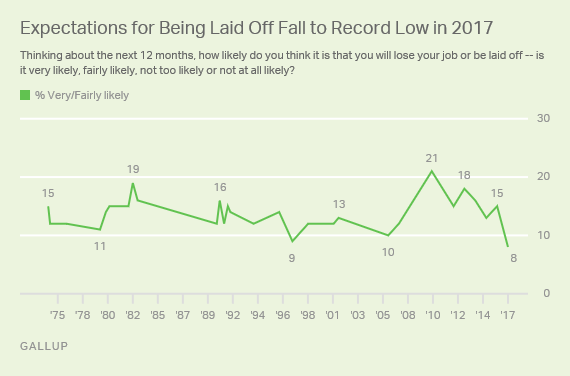 Gallup began asking the "fear of being laid off" question in 1975 and has updated it periodically since then, but has asked it annually since 2012. Across the 42-year span in which Gallup has asked this question, an average of 14% have said they are "very" or "fairly" likely to be laid off, but concerns about layoffs have reached as high as 21% in 2010 as unemployment approached double digits after the Great Recession. The current 8% of employees who say it is "very" or "fairly" likely they will be laid off this year is down seven points from one year ago. U.S. workers are much more likely to say it's "not too likely" they'll be laid off (29%). The majority, 62%, say it is "not likely at all." The full trend and responses are shown at the end of the article. It is not clear from the historical trend how greatly partisan considerations factor into workers' assessments of their job security. However, the percentage of employed adults who are Republicans or Republican-leaning independents are now less likely than they were in 2016 to say it is likely they will be laid off this year. There has not been a meaningful change among workers who are Democrats or Democratic-leaning independents. Roughly one in 12 U.S. workers harbor some concern they could be laid off in the coming year, but that's down from around one in seven last year and around one in five in 2010. Improvements in the overall job market -- based on government statistics and Gallup measures of hiring at workers' places of employment -- have likely reduced workers' concerns about layoffs. In addition to reporting more hiring at their workplaces, U.S. workers are more confident in the economy and are generally spending more. 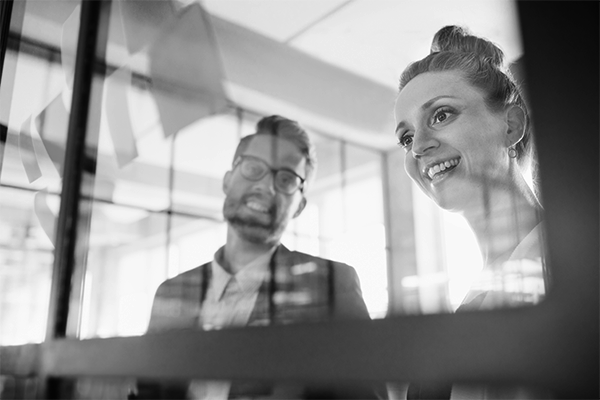 With employees reporting greater job stability and a majority of Americans saying it is a good time to find a quality job, a shift in the employer-employee dynamic could be taking place -- giving workers the upper hand while forcing employers to compete for top talent. Results for this Gallup poll are based on telephone interviews conducted April 5-9, 2017, with a random sample of 547 full-time or part-time employees, aged 18 and older, living in all 50 U.S. states and the District of Columbia. For results based on the sample of full-time or part-time employees, the margin of sampling error is ±5 percentage points at the 95% confidence level. All reported margins of sampling error include computed design effects for weighting.